Why are there a lot of stray cats and stray dogs? Every day we pass them by. They dodge cars, look for food in the garbage, battle malnutrition and sickness in silence. Perhaps you can say that their story is the same as any indigent on the street. But for this set of indigents, there is no government agency dedicated to their welfare (to give them low-cost medical care or provide them with a halfway home) . They don't vote, they can't speak and their "rights" are still not recognized by most members of society. And yet their pain and suffering is as real as yours and mine. Strays are not a random occurrence but a symptom of a bigger problem caused by the following: irresponsible pet ownership, pet owners not spaying/neutering their pets, people still BUYING and BREEDING instead of adopting or fostering shelter and rescue animals. The pattern observed from most Filipino concerned citizens is this: person sees a stray animal in need ---> person feels sorry for stray animals ---> person thinks the best way he/she can help is A) put up shelters or B) turn them over to shelters instead of supporting education, lobbying, prosecution and spay-neuter programs. The typical stray in the Philippines are domesticated animals, once family pets, thrown out into the streets when owners can no longer afford to feed them or when they get sick and their pet owner doesn't want to deal with making them better (financially, physically or emotionally). by "pagligaw" – the cruel practice of dumping animals in far away places where they won't be able to find their way back home. PAWS is a non-profit organization dedicated to educating people about kindness to animals and responsible pet ownership. Its small animal shelter (known as PARC - PAWS Animal Rehabilitation Center) cares for homeless animals who are victims of cruelty. To do your part to help the stray population problem, please spay/neuter your pets to keep them to a number that you can responsibly care for AND keep them indoors or within your property at all times. 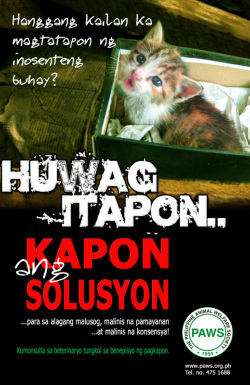 PAWS offers low-cost spay/neuter to pet owners, please read the rates here: http://www.paws.org.ph/veterinary-services.html and call tel. # 475-1688 during ofc hours (10am-5pm, Mondays to Saturdays except holidays) to schedule an appointment with the shelter vet. Pet overpopulation is the number 1 cause of animal cruelty. When people are inconvenienced by too many cats or dogs, they turn to cruel dumping or releasing of their pets into the streets or sidewalks. In these situations, dumped ex-housepets are at the highest risk of getting run over or targeted by cruel individuals. Stray dogs and cats that are fed, but not neutered – are more likely to reproduce at a faster rate. More stray dogs and cats translate to more incidents of bites which often lead local government units to panic and launch a massive collect-and-kill-stray-animals campaign . People call up PAWS mostly to turn over pets that have reproduced uncontrollably. They express surprise when PAWS explains that it does not take in pets of other people, only victims of cruelty or neglect where the animal offenders are charged with violation of Animal Welfare Act in court. But there is no “agency” that will take in unwanted pets except perhaps the City Pound or your local animal control unit. The animals are then put to sleep or euthanized if they are not claimed by anyone. It is quite naïve for people to think that there will be enough homes for all the animals that are brought into this world by unfixed pets. Or to think that there are takers for their abandoned animals when no rehabilitation has taken place behaviorally (for biting dogs) or physically (for unhealthy or sick dogs). If a pet owner has failed to make provisions for his pet financially, or find that he cannot rehome his pet when he is moving house or leaving the country, it may be best for the owner to actually take the responsible step of bringing the animal to his own vet to be euthanized properly. It is a sad story for a nation that has little awareness on spay-neuter surgeries that prevent pet pregnancies. Each month, an average city pound in the Philippines puts down 200 unwanted and unclaimed dogs. There are virtually no government-funded outreach spay-neuter programs – only anti-rabies vaccinations for dogs. Every little effort taken to spay a pet or a stray actually translates to preventing the birth of unwanted puppies or kittens, thus, saving lives. It is with this in mind that animal welfare groups all over the world celebrate International Spay Day – an event intended to encourage people to spay or neuter their companion animals. Strictly speaking, Spay Day is celebrated on the last Tuesday of February of every year but the Humane Society of the United States (HSUS), which launched the event, announced that Spay Day can be celebrated throughout the whole month of February. An added benefit of neutering animals: spayed or neutered pets live longer, healthier lives; less likely to develop some forms of reproductive cancers; are less likely to pick fights with other animals and are less likely to stray outside your yard in search of a mate.